Smile and enjoy the holiday and warm weather. Watch The Bush Turkey Connection. Minnesota produces more turkeys than any other state... over 46 million each year! The only major meat animal native to North America is the turkey. Over all the U.S. produces 155 million turkeys a year (not counting Bush et al!). The turkey is a variety of the pheasant. A male turkey is called a tom, and a female turkey is a hen. Only tom turkeys gobble. Hen turkeys make a clicking noise. 45 million turkeys are eaten at Thanksgiving, 22 million at Christmas, and 19 million at Easter. About 675 million pounds of turkey is consumed in the United States on Thanksgiving Day. The costume "Big Bird" wears on Sesame Street is made of turkey feathers. Abraham Lincoln's son, Tad, had a pet turkey. When it was suggested that the bird might make a fine holiday dinner, the boy set up such a howl of protest that the President finally issued a "Presidential Pardon" for Tad's pet. 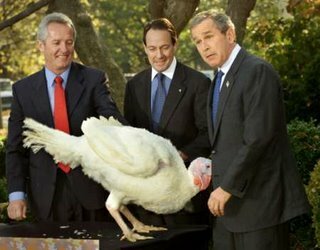 Each year, the live turkey is "pardoned" by the President and sent to a historical farm to live out the rest of its years. When Neil Armstrong and Edwin Aldrin sat down to eat their first meal on the moon, their foil food packets contained roasted turkey and all the trimmings.